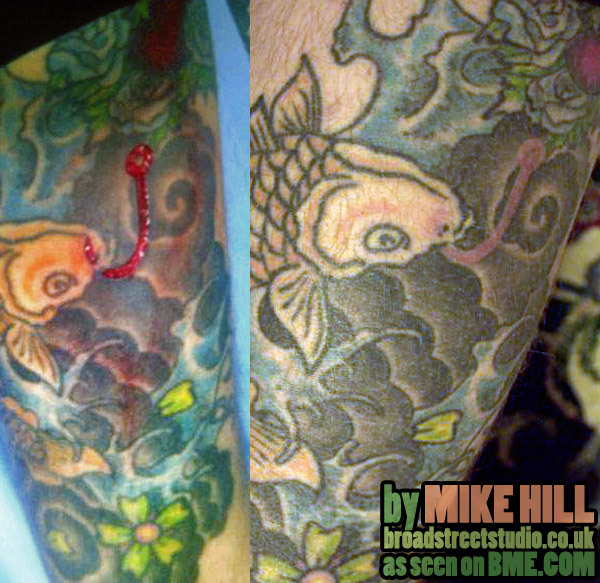 I got a message from Mike Hill at Broad Street Studio (broadstreetstudio.co.uk) in Bath, Somerset, UK telling me that they’re looking for a new tattoo artist at their studio and asking me whether I’d be willing to post a job ad for him… I told him I couldn’t really do that, but if he could find something interesting for me to post, well, as they say, “one hand washes the other”… So he got me some pictures of a recent scar he did on Tam Smith. Unlike most skin removal scars over tattoos, this is over a Japanese sleeve, rather than over blackwork, and the negative-space it creates interacts with the tattoo rather than standing solo. At first I’d assumed this was a tattoo on a fishing enthusiast, but it’s actually a flesh hook as Tam is part of the suspension community. If you’re a tattoo artist looking for work (or perhaps even a long-term working vacation in beautiful Bath), get in touch with Mike on Faceobook, or via their shop website. 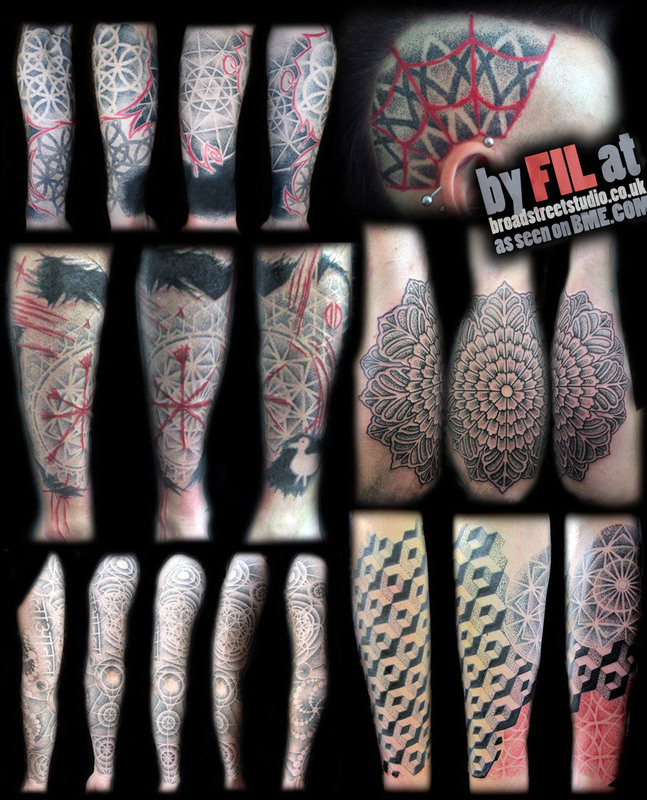 To give you an idea of the sort of shop you’d be stepping into, here’s some work done by Fil, another one of the tattooists that call Broad Street Studio home — that’s Mike’s head top-right (you may recognize it, because Rob featured it back in 2010). Click for a giant look. This entry was posted in ModBlog and tagged Dotwork Tattoos, Flesh Removal, Flesh Removal Scarification, Geometric Tattoos, job, Scar and Tattoo Combos, Skin Removal, Tattoos by Shannon Larratt. Bookmark the permalink.